After the Nostril Piercing: Advanced Fundamentals class (which I had the pleasure of teaching with the incomparable Alicia Cardenas) at the 2014 Association of Professional Piercers Conference my friend “Tall” Gary Vargas came up to me and said, “10 years in the industry. This is my first conference. I come to see your class …and you tell me to clamp a nostril”. Frankly, I understand where Gary is coming from and I imagine this sentiment was not rare within the ranks of our more than 200(!) attendees. Clamping nostrils isn’t just abnormal, it’s downright passé. The piercing industry has a love/hate relationship with tools in general. I actually run a piercing studio that disposes of every tool we use, which means I am always looking for opportunities to safely eliminate tool usage. Still, I really like tools. I like things that make my job easier. Piercers sometimes forget that tools are not the devil. At the end of the day our clients are much happier with well placed piercings that heal well than they are with innovative piercing techniques that impress other piercers. I have established from my previous entries that (by and large) we as piercers are attempting to make piercings that enter and exit perpendicular to the the nostril. The most simple and effective way to make this happen is by clamping the nostril. This isn't just because clamps are exceptionally good at delivering perpendicular piercings, but also because needle receiver tubes and freehand techniques can make it much harder than necessary. To put it another way: clamping can make nostril piercings (nearly) idiot proof. The rigid stiffness of the outside of the nostril means that when you place a clamp on, it is unlikely to distort the tissue (on the visible part of the nose). Since the clamp applies pressure on the inside and outside of the nostril equally, we have a very strong indication of how to pierce perpendicular to the tissue. Try placing a clamp on your own nostril crooked. Not only will you find it nearly impossible to do so, you’ll also see that if you manage to get a clamp on your nose crooked, it hurts. A lot. Your client will let you know if you’ve got the clamp on wrong, I promise. Clamping also eliminates a problem that receiver tubes create. Receiver tubes only support the inside of the nose. What many piercers do is push too hard on the receiver tube, pushing the nostril out of it’s natural position. This distorts our view of of what perpendicular truly is, and makes it significantly more challenging to get our x and y axes right. I mentioned before that the outside of a nostril is rigid, and unlikely to be distorted. That isn’t true of the inside of the nostril. The inside of the nostril is soft, delicate tissue. Having anything up the nose can cause your client discomfort. That’s why, when placing a clamp on the nostril, I gently place the clamp on the inside first. After I have established a comfortable place for the clamp to sit on the inside of the nostril, I gently apply pressure with the other side of the clamp. One of the best aspects of using clamps for nostrils is they give us visual cues as to 90 degrees. When we line up a needle in a clamp, we can see it line up with the handle of the clamp. This lets us know if we are wildly off of perpendicular (needle drift because of needle bevel should still to be accommodated for). The clamp provides a line to measure against. The clamp allows us to visualize perpendicular much easier. We can also visualize our X axis by looking for 90 degrees from the side of the clamp. Yes, you should be able to do that without the clamp… but the clamp takes the guess work out. Finally, the clamp provides a visual cue for itself. What I mean by that, is when you see the visible jaw of the clamp on the outside of the nose, you can visualize (in yer noggin) what the jaw on the inside of the nose looks like. On all but the widest nostrils, you are piercing where you are not able to see, so having all of these visual cues really adds up. As for choosing a clamp style, I prefer the smallest I can get my hands on. Mini-oval jawed clamps are great. Mini-triangular jawed can work as well, although you will want to make sure not to poke your client with the edge. Unfortunately disposable clamp technology hasn’t yet achieved very small jawed disposable models, but I am confident those are on the way. 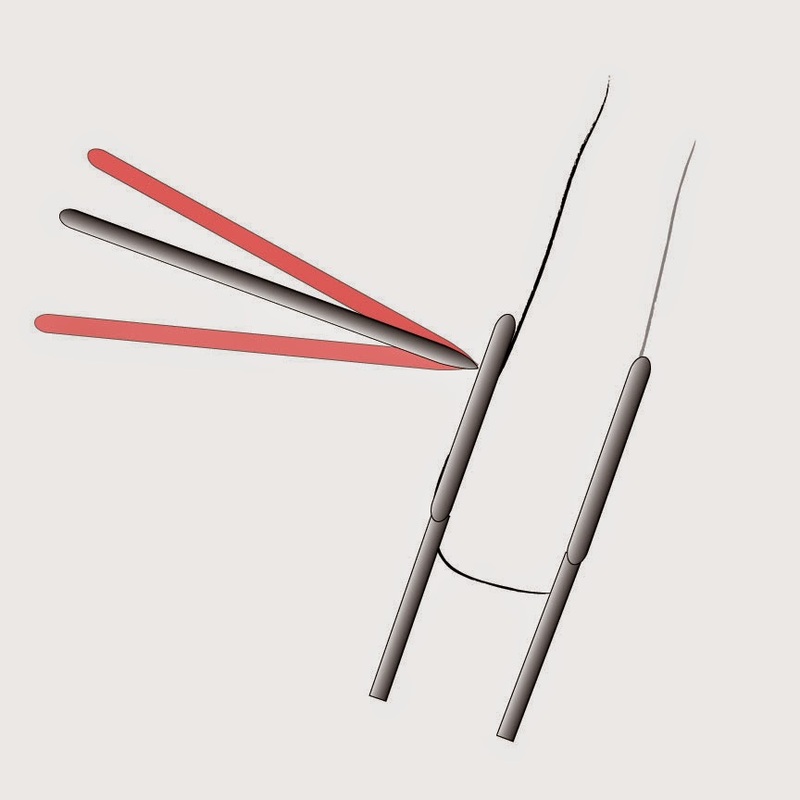 Disposable models tend to be built on the “tweezer” model instead of the hinged models we know by using metal clamps. I don’t mind either, so long as I feel like I have control over the pressure I am placing on the nostril. When I saw slotted piercing clamps introduced, I was skeptical of their effectiveness. If we are using a clamp to provide support, cutting a big chunk of that support out didn’t make a ton of sense to me. I also didn’t like the edges on slotted clamps. Over time, my stance against them has mellowed. Most disposable options are only available slotted, which meant I had to learn to use them. Now that I have experience with them, I’d say my initial concerns were overblown, to an extent. I still prefer non-slotted options, but I feel comfortable with either option being effective. At this point, I am ready to execute the piercing. There are two schools of thought when it comes to preparing to pierce. Some piercers “hover” their needle above the dot they are about to pierce through, while others place the needle on the mark and let their client get used to the sensation of the needle against their skin. I am in the latter category, and you will notice in my tutorial videos I am not shy about setting the needle against the skin for some time before I proceed with the piercing. I don’t think there is a right or wrong approach, honestly. It comes down to the comfort level of the practitioner. I do think the hover method is better for more experienced piercers. Before performing the piercing, you need to make sure the needle will not go through the nostril and right into the septum. If you did that, it would not be the end of the world; although it probably won’t feel good and will result in some unnecessary bleeding. We are in the business of keeping clients, after all, so let’s take steps to prevent doing that. I suggest holding the needle with a thumb and middle finger about ¼ to 5/16ths of an inch from the end of the bevel of the needle, while supporting the back of the needle with the index finger. 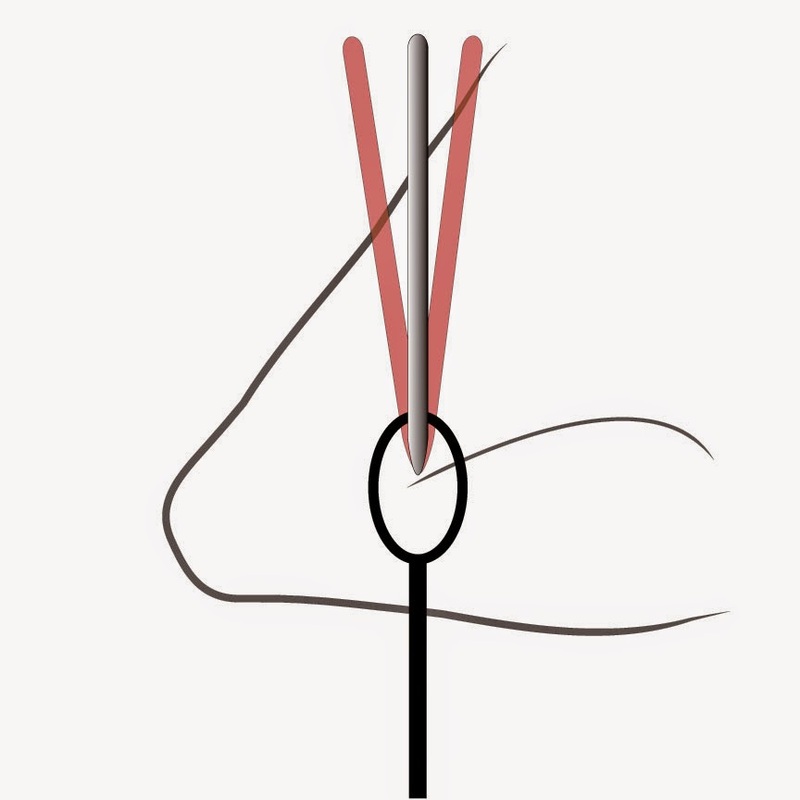 This way, when your thumb and index finger hit the clamp, the needle has traveled the average length of your jewelry plus the length of the bevel, which is enough for the needle to exit the skin but not so much that the needle pokes the septum. Obviously, your client’s nose will determine exactly how far you can push without hitting their septum. Hold your needle accordingly. Once the needle bevel has completely come out the exit side, then and only then can you change angles and get the needle out of the nasal cavity. After this, you can safely insert the jewelry of your client’s choice. I really can’t go a blog entry without mentioning Fakir Musafar, mostly because these principles I am writing about originated with my training at the Fakir Intensives. I’d love to say I came up with most of this, but I didn’t. Fakir Musafar and Course Administrator Ken Coyote are to thank for most of my understanding of body piercing. In the Fakir Basic class, Fakir introduces the concept of the “Auto-Correcting Mechanism”. This is a trick your brain plays on your hand-eye coordination to make you hit what you want to hit. Fakir learned this by doing trick shooting. You don’t look at your gun, you look at your target. Your brain will auto-correct and help you hit the target (with practice, of course). What this means is, when I pierce I first set my needle on the tissue that I am piercing. Then make sure my bevel orientation is correct (and that I am using the cutting surface of the needle). Once I have that side of the clamp set, I can divert all of my attention to the exit side of the piercing. My auto-correcting mechanism will make sure I do not pierce at a strange angle. I will focus on the exit and I will hit it, over and over and over again. I suggest practicing this technique a lot on a piece of foam board or silicone. Once you have established confidence with the auto-correcting mechanism, then you can use it to assist you in piercing your client. If I cannot see inside the nostril (even while wearing my trusty headlamp), I make sure I am visualizing the clamp on the inside of the nose. I know where I want the needle to exit, in reference to the perfect exit position in the clamp. I concentrate on that spot and pierce smoothly right at the spot. I will always hit it, and you will too. At that point, it is easy to insert jewelry, clean your client, and proceed with the rest of your day. One more perfect piercing leaves your studio and the world is a better place for it. Have you wowed piercers on the internet? No. Have you wowed your client? Yes. And that’s what’s important here. This video is an example of a clamped nostril piercing using a Snaptile disposable clamp. The insertion is performed using sterile needle blanks (19 gauge and 26 gauge) from Industrial Strength, LLC. The jewelry is an 18 gauge 5/16 Neometal flatback with a 2.5mm moonstone end. Clamped nostrils are not a step backward as a piercer. Often times, stepping outside of your comfort zone (safely) will only improve your usual piercing routine. Good piercers routinely challenge themselves with new techniques or revisiting old ones. Ken Coyote suggests you try a new technique 25 times. After applying “the rule of 25”, you should have enough experience to really form an opinion on the technique. When clamping nostrils, the first few tries will seem foreign. The few after that, you’ll start to see how clamping tissue like this provides tremendous tissue support and visual cues. After that, well, you will be able to decide if clamped nostril technique is really for you... Or if I am totally crazy. I hope you enjoy this first technique installment. In subsequent blog entries I will discuss receiver tube and freehand techniques.